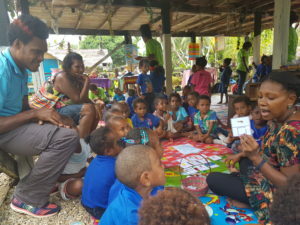 Through our local partner, Buk Bilong Pikinini, the Komuniti Early Learning Program aims to provide children in remote communities with access to high quality and effective early childhood education, thereby increasing their school readiness and early literacy skills. The program will have a particular focus on ensuring the inclusion of children with disability in community-based education programs. Formal education was only established relatively recently in many parts of Papua New Guinea, and its reach is limited. 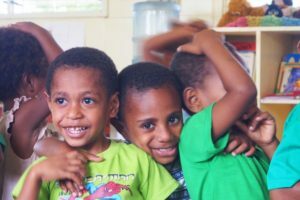 In fact, the average level of formal education for adults in PNG is only 3.9 years and today only one in three children complete their basic education. Elliuda lives in a small coastal village in the Vanimo region of Papua New Guinea. Elliuda’s 6 year old son, Tomas, recently started elementary school after spending 2 years participating in the early learning program supported by Mary MacKillop Today. A proud dad, Elliuda beamed as he spoke of Dan’s progress from his pre-school into elementary school. Elliuda believes his son’s eagerness to learn stems from his days at the community early learning program. Exposure to the life-changing impact of early childhood education has also led Elliuda to understand what an important role he can play as Tomas’ dad.